The "Red Thing" is named Snakes and Snails. 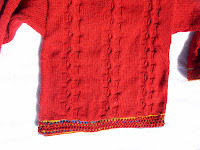 It is a little boy sweater for Oasis yarns. The yarn is Aussie Sock. After I sewed the shoulders, it looked like the back was longer than the front. De-Nile comes in here. I had washed the back to remove spilled food, which spilled in my bag in transit. I thought I had counted repeats when making the front. I wrote the pattern. I should have been able to do it right the first time. After neck shaping, the pattern says' " Work straight if needed to match back length." That step seems to have been missed. The front was one repeat shorter. Much of today was spent removing all the neck and front bands and unstitching seams to add one inch to the front. Neck bands are being replaced and numbers altered in the pattern. Next up is Fiesta Thing for a little girl. Colors are reversed from the boy sweater. I swatched the body pattern and then started the bottom ruffle. It looked too wide. Frog pond time. I thought I had used a needle smaller than planned for the swatch, not so. It was knit on a circular needle so the mistake was possible. A second swatch was knit. The ruffle is again finished for the back. Body knitting for this sweater will commence after repairs to the red sweater are finished. I have promised to deliver the red one next Saturday when I see the Oasis owner at Knitter's Fantasy. I also need to print up enough patterns for him to sell at the show. The other night I worked on pattern grading. I have Garment Designer on my laptop as well as my desktop, and have versions of the Snakes pattern in both. It made pattern writing easy. I have the pattern on the desktop and used GD on the laptop for measurements and stitch count in the various sizes. The pattern now has sizes 2, 4, & 6. I will do 8 & 10 this weekend. Deadline for the whole two sweater project is the TNNA show in Columbus, OH the beginning of June. Spring is definitely here in NE Ohio. I see crocuses on our dog walks. There are none in my yard. We had landscaping done following garage construction a few years ago and most of the bulbs never reappeared. This year I have been buying pots of spring flowers and planting the bulbs when the flowers die. I'm always too busy in the fall when I should plant the bulbs. I'm really getting busy with prom dresses at work. I'll try to show some piece/parts as I go along. I also have spring flowers growing at work. I bought a kit from the fabric store, and have tulips growing on top of my air conditioner.